Sports fans will not want to miss the chance to see the famous Milano-San Remo Cycling Race, whose first edition was held on 14th April 1907 and won by Frenchman Lucien Mazan, best known as Petit Breton. The race begins along the foggy plains around Milan and reaches the sea going through the Passo del Turchino, which is considered the natural gate leading to the sea and the sunshine. It is undoubtedly a tiring and difficult, though fascinating, race which is characterised by straight stretches and hairpin bends and goes through the hills and along the coast. As one of the most prestigious cycling races, it can definitely make the onlookers dream and sigh right to the finish line. One of the most difficult lags, the Poggio, has to be literally conquered thrust after thrust on the pedals – and it can really make the difference for real champions who can finally prove their determination and strength right to the finish line. The cyclists will then swiftly ride between a cheering crowd that will warmly support them. 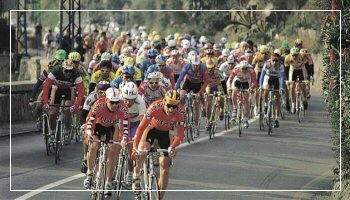 The Milano-San Remo Cycling Race is a traditional spring event, perfectly timed to fully enjoy being under the sun while caressed by the gentle sea-breeze, all while taking part into one of the most famous Italian cycling races. In late spring, there will also be the Milano-San Remo Cycle-Touring Race for amateur cyclists. Cycling lovers from all over Europe will then be able to race along the very same route of the professional race.